The FLEXI-TIE is a heavy duty, double locking, reusable method for bundling all hard and soft objects. It is ideal for sensitive cables such communication and network cables as it bundles them together without damaging, bending or cutting into them. 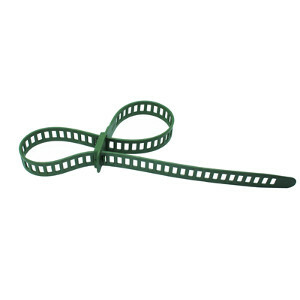 It is ideal for light and heavy duty strapping and is perfect for securing trees bushes and shrubbery without cutting into them. The FLEXI-TIE is an essential must have for the outdoor enthusiast.